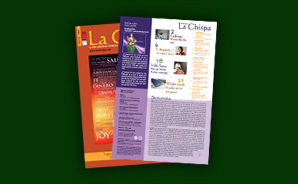 In my previous articles in La Chispa I spoke about the 1st phase of Magnified Healing and the Celebration (2nd phase). When a person initiated in the first phase has been practising for four months and in this way has established and aligned the energy of MAGNIFIED HEALING and has been healing others (directly or with absent healing), then they are ready for the third phase. This phase amplifies the 1st phase with much more information, and the person to be initiated is taught how to use two special ‘rays’ given by Lord Melchizedek as well as two other ‘tools’ given by Metatron. As with the first phase this new method can be used for healing one self and others directly or with absent healing, healing the planet, healing animals and plants. But by using the new ‘tools’ a practitioner can effectively go directly to the source of the client’s problem, working on an energetic level, resolving the problem and always co-operating with the client. The third phase workshop is two full days, including practising. All workshops are held in very small groups to create a personal and uplifting experience.